This section describes power requirements, mounting provisions, and alignment procedures for installing diesel engines in motor vehicles, stationary applications, and small boats. What I have tried to do here is to provide information that does not have wide currency, but is so critical that it makes or breaks the installation. Vendor catalogs serve for other aspects of the job, such as radiator/keel cooler sizing, selection of anti-vibration mounts, and sound-proofing techniques. Normally, installation is a bolt-on proposition, but things become complex when engines or transmissions are not as originally supplied. Operators often judge a truck's power, or lack of it, by how fast the truck runs. In other words, operators look at maximum rated horsepower available at full governed rpm. But expected road speeds may be unrealistic. For example, numerically low axle ratios can, up to a point, increase top speed, but at the cost of reduced acceleration and less startability, a term that is defined below. Other factors that influence top speed are loaded weight, road conditions, wind resistance (which can double when loads are carried outside of the vehicle bodywork), and altitude. Naturally aspirated engines lose about 3% of their rated power per 1000 ft of altitude above sea level. The desired cruising speed should be 10% to 20% below rated horsepower rpm, to provide a reserve of power for hill climbing and passing. When fuel economy is a primary consideration, the cruising speed can be set even lower. The power required at cruising speed is the engine's net horsepower. Other factors to consider are the ability of the vehicle to cope with grades. Startability is expressed as the percentage grade the vehicle can climb from a dead stop. A fully loaded general-purpose truck should be able to get moving up a 10% grade in low gear. Off-road vehicles should be able to negotiate 20% grades, with little or no clutch slippage. Startability is a function of the lowest gear ratio and the torque available at 800-1000 rpm. Gradeability is the percentage grade a truck can climb from a running start while holding a steady speed. No vehicle claiming to be self-propelled should have a gradeability of less than 6%. Gradeability depends upon maximum torque the engine is capable of multiplied by intermediate gearing. Caterpillar and other engine manufacturers can provide assistance for sizing the engine to the particular application. But it's useful to have some understanding of how power requirements are calculated. The power needed to propel a vehicle is the sum of driveline losses, air resistance, rolling resistance, and grade resistance. driveline eff. _ overall efficiency of the driveline, calculated on the assumption that each driven element-main transmission, auxiliary transmission, and rear axle- imposes an efficiency penalty of 4%. Thus, a truck with a single transmission and one driven rear axle would have an overall driveline efficiency of 92% (0.96 _ 0.96 _ 92%). Without some sort of provision to smooth airflow, the truck has a modifier of 1.0. If an aerodynamic device is fitted, the modifier is 0.60. For purposes of our calculation, frontal area _ width in feet _ (height in feet _ 0.75 ft). where GVW represents the gross vehicle weight in pounds, and Crr represents the rolling resistance. This latter figure depends upon tire type: on smooth concrete, bias-ply tires have a Crr of 17 lb/ton and radial tires 11 lb/ton. Low-profile tires do even better. In most instances, the technician merely bolts the engine down to a factory-designed mounting system. But there are times when engine-mounting provisions cannot be taken for granted. Vehicle engines traditionally use a three-point mounting system, with a single point forward around which the unit can pivot, and with two points at the flywheel housing or transmission. For some engines the forward mount takes the form of an extension, or trunnion, at the crankshaft centerline. A sleeve locates the trunnion laterally, while permitting the engine to rotate. In order to simplify mounting and give more control over resiliency, other engines employ a rigid bracket bolted to the timing cover and extending out either side to rubber mounts on the frame. Rear mounts normally bolt to the flywheel cover and function to locate the engine fore and aft, while transmitting the torque reaction to the vehicle frame. In order to control vibration, mount stiffness must be on the order of one-tenth of frame stiffness. On many applications the transmission cantilevers off the engine block without much additional support. The bending moment imposed by the overhung load on the flywheel housing should be calculated and compared against factory specs for the engine. FIG. 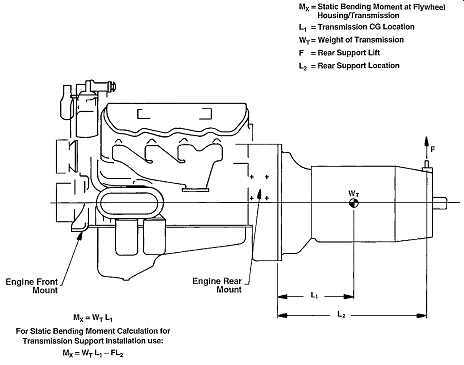 1 illustrates the calculation for a transmission that receives some additional support at the rear with a third mount. The third mount should have a vertical rate (lb/in. of deflection) considerably lower than the vertical rate of the rear engine mounts. A transmission mount with a higher spring rate than the engine mounts increases the bending moment. In addition, the high spring rate is almost sure to deflect the truck frame and, in the process, generate high forces on the engine/transmission package. Off-road trucks present special problems, since engines and transmissions are subject to high gravity loads and the potential for frame distortion. Another factor that needs to be taken into consideration is that motor mounts must be able to absorb the torque reactions generated by the ultra-low gear ratios often specified for these vehicles. FIG. 1 If we think of the motor mounts as springs, it’s easy to see that adding a transmission mount reduces the bending forces applied to the bell housing by the weight of the transmission. However for this to happen, the transmission mount must have a lower spring rate than the rear engine mounts. A high spring rate at the transmission neutralizes the rear motor mounts so that the whole weight of the engine and transmission is shared between the front motor mounts and the rear transmission mount. Bending forces increase. And, in practice, frame members adjacent to the transmission mount bend. From Caterpillar Inc.
Power requirements for stationary applications can be difficult to calculate. Wherever possible, engine selection should be based upon experience and verified by tests in the field. Caterpillar rates its industrial engines on a five-tier format based on load- factor duty cycle, annual operating hours, and expected time between overhaul. The load factor is a measure of the actual power output of the engine that, at any particular throttle setting, depends upon load. For example, an engine set to produce 300 hp will produce 50 hp under a 50-hp load, 100 hp under a 100-hp load, and so on. Fuel consumption increases with load demand. The load factor indicates how hard the engine works, and is calculated by comparing actual fuel usage with no-load usage at the throttle setting appropriate for the application. • Industrial A-100% duty cycle under full load at rated rpm. Applications include pipeline pumping stations and mixing units for oilfield service. • Industrial C-Maximum duty cycle 50%, with one hour at full load and speed, followed by one hour at reduced demand. Applications include off road trucks, oilfield hoisting, and electric power generation for oil rigs. • Industrial D-Maximum duty cycle not to exceed 10%, with up to 30 minutes of full load and power followed by 1 hour at part throttle. Used for offshore cranes and coiled-tubing drilling units where loads are cyclic. • Industrial E-Maximum duty cycle not to exceed 5%, with no more than 15 minutes at full power, followed by one hour at reduced load. E-rated engines may need to develop full power at starting or to cope with short term emergency demands. All things equal, an oversized engine works at a lower load factor and should run longer between overhauls. Power in reserve also means that overloads can be accommodated without loss of rpm. Power, the measure of the work the engine performs over time, is only part of the picture. Engines also need to develop torque, an instantaneous twisting force on the flywheel, commensurate with the torque imposed by sudden loads. Load induced torque slows and, in extreme cases, stalls out the engine. The relationship between engine torque and load torque is known as the torque rise. If peak torque demand were twice that of engine torque, the torque-rise percentage would be only 50% and we could expect the engine to stumble and stall under the load. If, on the other hand, engine torque equaled load-induced torque, the engine would absorb the load without protest. However, high-torque-rise engines stress drivelines, mounts, and related hardware. Some compromise must be made. It should also be noted that not all driven equipment impose sudden torque rises. For example, centrifugal pumps and blowers cannot lug an engine because the efficiency of these devices falls off more quickly with reduced speed than engine torque. Gen-sets run at constant speed and don’t require much by way of torque rise. On the other hand, positive-displacement pumps generate high torques when pump output is throttled. As the engine slows under load, the governor increases fuel delivery. Naturally aspirated engines respond quickly, since the air necessary to burn the additional fuel is almost immediately available. Turbocharged engines exhibit a perceptible lag as the turbo spools up. But naturally aspirated engines have difficulty in meeting emissions limits and, for the same power output, are heavier and more expensive than turbocharged models. Some industrial engines employ a small turbocharger for low speed responsiveness and a second, larger unit for maximum power. Variable geometry turbocharging (VGT) virtually eliminates lag time. The black smoke accompanying turbo lag can be reduced with an air/fuel ratio controller. Also known as a smoke limiter, the device limits fuel delivery until sufficient boost is present for complete combustion. Adjustment is a trade-off between transient smoke and engine responsiveness. 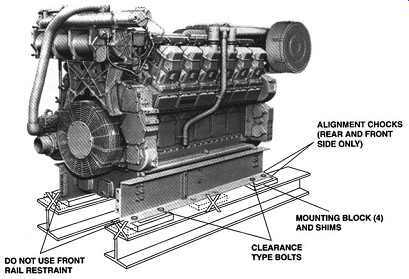 The engine manufacturer normally has final say on the mounting configuration that may consist of parallel rails or, in the case of several Caterpillar oilfield engines, a compound base. In the later arrangement the engine bolts on an inner base, which is suspended on springs above the outer base. The technician has the responsibility to see that engine mounts permit thermal growth and that engine and driven element are in dead alignment. Cast iron "grows" less than steel when exposed to heat. The coefficient of expansion is 0.0000055 for cast iron and 0.0000063 for steel. A 94-in.-long iron engine block will elongate 0.083 in. as its temperature increases from 50° to 200° F. Under the same temperature increase, 94-in. steel mounting rails grow 0.089 in. These parts must be free to expand. Caterpillar 3508, 3512, and 3516 oilfield engines mount on a pair of factory supplied rails bolted to the oil pan. Standard procedure is to tie the engine down to the rail with a fitted bolt, that is, a bolt inserted with a light push fit into a reamed hole at the right rear corner of the oil pan. This bolt provides a reference point for alignment. Other engine-to-rail mounting bolts fit into oversized holes in the rails to allow for expansion. Clearance-type bolts should be 0.06 in. smaller than the diameter of the holes in the rails ( FIG. 2). Chocks, used as an installation convenience to position the engine on the rails, must not constrain thermal expansion. Begin by cleaning all mating surfaces to remove rust, oxidation, and paint. If rubber couplings are present, remove them. It may be necessary to fabricate a dial-indicator holder from 1 1/2-in. steel plate that can be bolted down to the machine. While this sounds like overkill, many commercially available magnetic indicator holders lack rigidity. Flex in the holder can be detected by the failure of the indicator to return to zero when the shaft is rotated back to the initial measurement position. Parallel misalignment occurs when the centerlines of the engine crankshaft and driven equipment are parallel, but not in the same plane ( FIG. 3). Mount a dial indicator on the engine flange with the point against the driven flange. Make several readings while a helper bars over the crankshaft in the normal direction of rotation. The driven, or load, shaft should, as a general rule, be higher than the engine shaft. Engine main bearings typically have greater clearance than driven-equipment bearings. Until the engine starts, the crankshaft rests on the main-bearing caps, one or two thousandth of an inch below its running height. In addition, some allowance must be made for vertical expansion of the engine at operating temperature, which is nearly always more pronounced than the vertical expansion of the driven machinery. FIG. 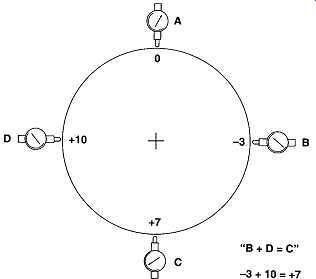 4 illustrates a method of verifying dial-indicator readings on the outer diameters (ODs) of flanges and other circular objects. Zero the indicator at A in the drawing and, as the flange is rotated, make subsequent readings 90° apart. If the indicating surface is clean and the instrument mount secure, the needle will return to zero in the A position and B _ D readings will equal C.
Measurement of angular misalignment can be made with a feeler gauge ( FIG. 5). Once the problem is corrected by shimming, bolt the flanges together and verify that the crankshaft can move fore and aft a few thousandths of an inch against its thrust bearing. FIG. 2 General arrangement indicating chock and shim positions for mounting a stationary engine on rails. Caterpillar Inc. FIG. 3 Parallel misalignment occurs when the centerlines of drive and driven equipment are parallel, but not in the same plane. Caterpillar Inc. FIG. 4 B+ D = C holds for round objects measured with accurate dial indicators. Caterpillar Inc. Parallel and angular misalignment can originate in driveline hardware, which rarely gets the scrutiny it deserves ( FIG. 6). Parallel misalignment, called bore runout, refers to the lack of concentricity between the bore of a hub and the shaft centerline. 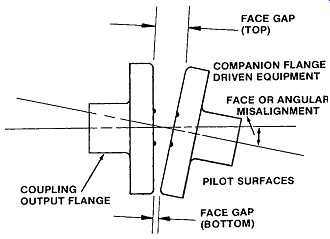 Angular misalignment occurs when the mating face of a flange is not perpendicular with the shaft centerline. This sort of machining error is known as face runout. Bore runout between the flywheel inner diameter (ID) ) and the crankshaft pilot bearing should be no more than 0.002 in., and no more than 0.005 in. for adaptors that make up to the flywheel. The maximum face runout for driveline components is 0.002 in. FIG. 5 Angular misalignment nearly always reflects the lay of the shafts. But mis-machined flanges can also contribute to the problem. Caterpillar Inc. FIG. 6 Possible face and bore misalignments. Caterpillar Inc. FIG. 7 Hold-down bolt torque limits and tightening procedure. Caterpillar Inc. FIG. 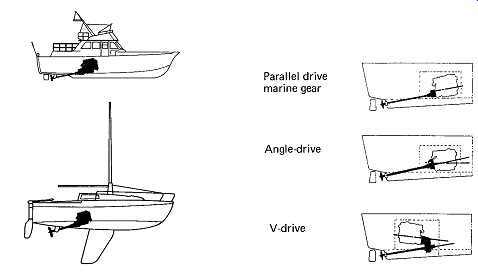 8 Engine-room layout and driveline configurations for Yanmar and other small engines. Generators, transmissions, and other close-coupled driven elements that bolt directly to the flywheel housing can also suffer from misalignment. As a check, loosen the bolts securing the unit to the flywheel housing and measure the gap between the parts with a feeler gauge. The interfaces should be within 0.005 in. of parallel. It’s good practice to determine the bending moment of components cantilevered off the flywheel housing, as described previously under truck "Motor mounts." Use brass shims (steel shims expand as they rust) and tighten the typical four bolt mounting as shown in FIG. 7. Grade-8 hold-down bolts are torqued to specification, an operation that requires a large torque wrench and a torque multiplier in the form of a 3- or 4-ft cheater bar. Because of the one-off nature of most small-boat construction, the technician is very much on his own when mounting an engine. FIG. 8 provides an overview of the installation of Yanmar engines on sail and powered boats. Inboard engines should be mounted level port-to-starboard and inclined no more than 15° off the horizontal ( TBL. 1). Higher crankshaft angles reduce drive efficiency and increase the likelihood of oil starvation for engines with forward mounted oil-pump pickup tubes. 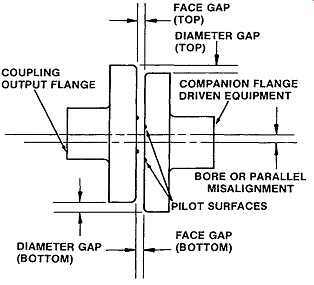 Your supplier will assist in determining propeller diameter, pitch, and style. As installed, the propeller should be at least one propeller diameter below the water line and permit the engine to achieve maximum rated speed under full load at wide open throttle. If the engine overspeeds by more than 5%, the propeller is undersized. Once you have determined the inclination angle at which the engine will be installed, construct the bed, which should have as large a footprint as hull construction permits. 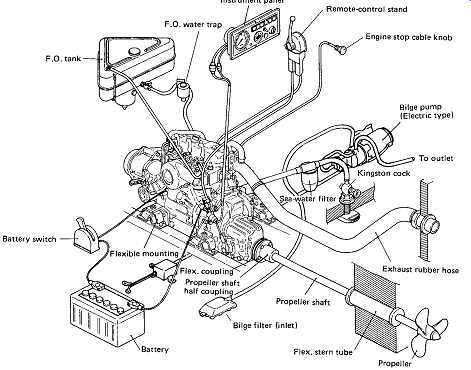 Leave room around the engine for servicing and, if possible, arrange matters so that the engine can be removed without structural alterations to the vessel. There must also be sufficient clearance between the flywheel cover/transmission and hull for compression of the flexible motor mounts. Determine the height of the crankshaft centerline with the engine resting on its mounts. You should be able to get this data from the engine maker. The next and very critical operation is to mark holes for the prop shaft. Some yards use a laser alignment tool, while others rely upon the more traditional approach described here. Construct a wooden jig, like the one shown in FIG. 9, and secure it to the for ward engine-room bulkhead. Run a string from the jig to the stern box. Verify that the inclination is correct and that the string is on the vessel centerline. Measure the vertical distance between the string and hull to establish that the transmission, clutch, and other components have sufficient clearance. Using the string as a guide, mark stern-tube hole locations on the forward and aft sides of stern, or stuffing, box. Drill small holes where indicated on both sides of the box. Pass the string through these holes, which almost certainly won’t center in the previously drilled holes. FIG. 10 illustrates how the final hole dimensions are arrived at. 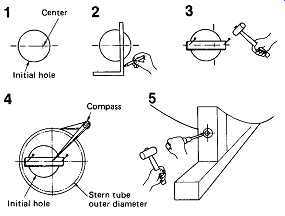 Hole diameter should exactly match stern-tube diameter. At this point, the crankshaft centerline and stern tube should be in fairly close alignment. Seal the stuffing-box holes with silicone, bolt down the stern tube, and secure the free end of the string to the center of the prop shaft. Using a fabricated marker, align the shaft with the string ( FIG. 11). 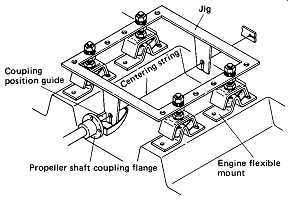 The next step is to fabricate an engine-mounting jig with holes for the string at crankshaft location ( FIG. 12). Place the jig on the engine bed and adjust the height and position of the mounts as necessary. FIG. 9 An alignment jig mounts on the engine-room forward bulkhead. FIG. 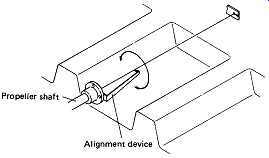 10 Accurate alignment is a process of refining approximations: the boat builder drills pilot hole through both faces of the stern box and threads the string through it for a better fix on shaft alignment. FIG. 11 In preparation for final alignment, a home made indicator is affixed to one of the flange bolt holes and the shaft centered over the string. FIG. 12 A jig that replicates the crankshaft-centerline/ motor-mount relationship helps to avoid the embarrassment of re-drilling engine-mount holes. 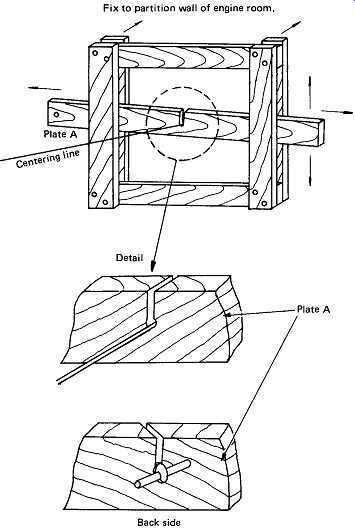 Once the shaft aligns with the jig, all that remains is to verify flange alignment as described for stationary engines. FIG. 13 Exhaust system showing major elements and dimensions above the loaded draft line. The draft line is a convenient marker, but the critical reference is the waterline. Power boats assume a stern-down attitude at speed, which raises the water line. In the application shown, a riser is used to elevate the mixing elbow and the water-injection point 6 in. or so above the waterline. Finally, mount the engine and align the prop-shaft flange with the transmission flange as described previously for stationary engines. Wet exhaust systems reduce engine-room heat and simplify installation by allowing oil- and heat-resistant flexible hose to be used aft of the mixing elbow ( FIG. 13). • Exhaust outlet at transom-at least 6 in. above the loaded draft line. • Elbow inboard of the transom-at least 14 in. higher than the draft line. • Muffler-inboard of the elbow, with the outlet inclined about 8° off the horizontal. • Water trap-located at the lowest point of the system between the muffler and engine. While a water trap is recommended for all installations, the backpressure developed by the unit can result in turbocharger surge. If this condition occurs, consult the engine manufacturer. It may be necessary to derate the engine by fitting a smaller propeller. • Cooling-water injection point-6 in. 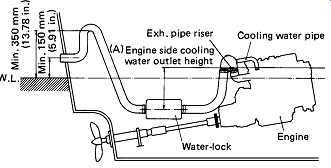 or more above the draft line to prevent water in the hose from flowing back into the engine upon starting and after shutdown. When necessary, a riser can be used to raise the height of the mixing elbow.